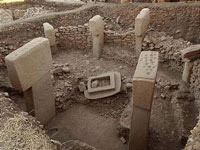 Uncovered near Sanliurfa, Turkey, the earliest known ancient ruins called Gobekli Tepe carbon dates to around 9,000 BCE and features carvings with an unknown language that may also be the earliest known form of writing. The ruins are formed in rings of megalithic blocks estimated to weigh 7 to 50 tons each, and are intricately carved with animal figures. Theorists state the megaliths were placed by piling sand up, then making a platform, and digging the pillars out. Further theories suggest the opposite, that the megaliths were purposely buried in order to hide them, or that blowing sands over the years covered everything up. It's estimated that another 50 years of digging could finally uncover the entire site. So far there are no sources explaining what the symbolic language means or who was responsible for creating Gobekli Tepe. One significant find, though, is a sphinx appearing to be later replicated ~7,000 years later in Egypt on a grand scale. Gobekli is a very mysterious site because understanding the motives for this type of heavy block construction, and the use of animal-based symbolic language in this manor, may help us to rediscover a significant part of human history prior to even the most famed megalithic sites around the world. Many theories have surfaced along with the discovery of Gobekli, from surmising they were built by the ancestors of those who constructed Stonehenge, to being the ruins of a previously unknown astronomically influenced society. It may now take up to 50 years to unlock Gobekli Tepe's secrets, yet those answers are thousands of years in the making.